At Nature's Best we stock a delicious range of treats for small animals, providing them with a wonderful and rich source of vital nutrients in a convenient treat form. 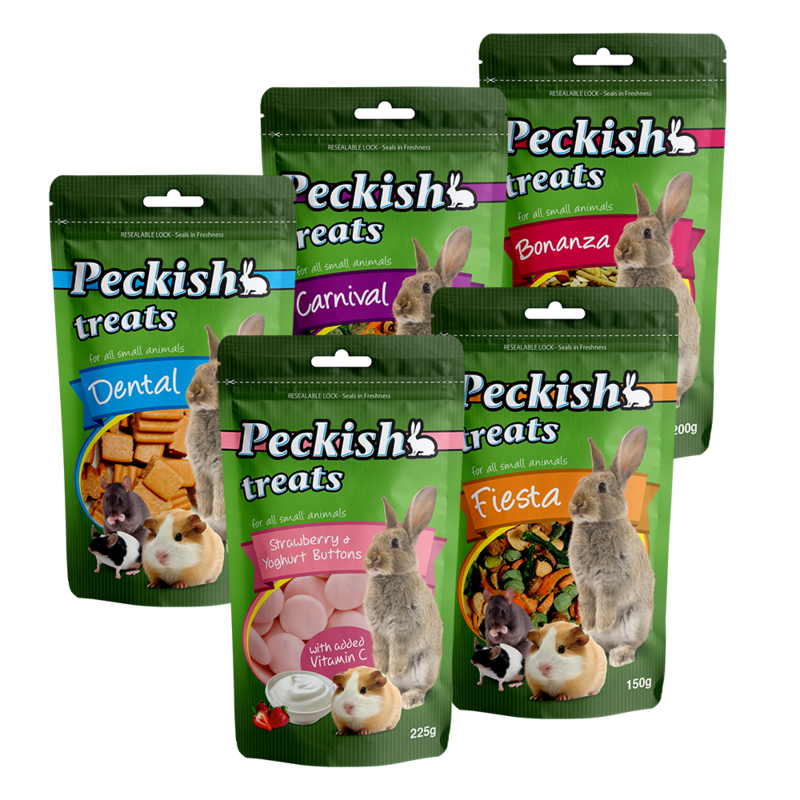 Show them exactly how much you love them with our own Peckish Treats range to spoil your little furry friends. With high quality ingredients, all of these treats have a combination of nutrients and delectable flavours for them to enjoy. All treats should be used in moderation with only around 20 grams given per serve. No more than 50 grams of Peckish Treats should be consumed by your pet per day. *Certified segregated sustainable palm kernel oil. Selected from: Rolled Oats, Rolled Barley, Bran, Sultanas, Strawberry, Apple, Mango, Wheat, Barley, Lupins, Oats, Rye, Corn, Soybeans, Lucerne, Salt, Di-calcium Phosphate, Vitamins, Minerals. Peckish Treats "Bonanza" has been formulated from high quality ingredients as a treat for your little friend. Ideally suited as a breakfast treat, it has a great balance of cereals, dried fruit, extruded fruit treats and high fibre mini twigs. Selected from: Carrots, Beans, Parsley, Pumpkin, Beetroot, Wheat, Barley, Lupins, Oats, Rye, Corn, Soybeans, Lucerne, Salt, Di-calcium Phosphate, Vitamins, Minerals. Peckish Treats "Carnival" has been formulated with the latter half of the day in mind. Carnival contains a blend of both dried Australian vegetables and extruded vegetable treats. While your little friend will really enjoy this great blend of flavours, they will also get the added dental benefit from eating treats and dried vegetables that are harder than the majority of their normal feed. Selected from: Rice flour, Wheat, Carotene, Gum, Rice grits, Tapioca, Gelatine, Citric acid, Lecithin, Potassium sorbate, Canola oil, Glycerine, Water. Many small animals including Rabbits, Guinea Pigs, Rats and Mice have teeth that grow throughout their lifetime and at times may overgrow due to a failure in the normal grinding process. To assist with this, Nature's Best have designed Peckish Dental treats. These dental treats are made to be extremely hard but still edible with carrot flavouring popular with all small animals. If you become aware that your pet's teeth continue to stay too long, it is best to consult your veterinarian who will be able to trim them for you. Selected from: Carrots, Beans, Pumpkin kernels, Parsley, Beetroot, Strawberry, Mango, Wheat, Barley, Lupins, Oats, Rye, Corn, Soybeans, Lucerne, Salt, Di-calcium Phosphate, Vitamins, Minerals. Peckish Treats "Fiesta" is as the name suggests - a party in a bag for your small animal friends. Fiesta contains a unique blend of dried Australian vegetables, pumpkin seeds, extruded vegetable treats and extruded fruit treats. This combination of ingredients will give your small animal friend a sensory delight unlike any other. Perfect for your small animals, Hartz Salt and Minerals Wheels provide an abundant source of salt and minerals that is an essential part of any small animal's diet. Suitable for rabbits, guinea pigs, rats, mice, ferrets, and other small animals. Available as Salt Wheels, Salt & Mineral Wheels, and Mineral Wheels. Penn Plax Ice Cream Mineral Chews provide your small animals essential salt and trace minerals, and help keep teeth trimmed. The chews easily attach to any wire cage and provide hours of amusement, whilst satisfying the need to chew. Penn Plax Pumice Chews provide your small animals essential salt and trace minerals, and help keep teeth trimmed. Features a fruit scent to entice your small animals to gnaw and lick. The licks easily attach to any wire cage and provide hours of amusement, whilst satisfying the need to chew. Penn Plax Turtle Caci-Bone provides an excellent source of calcium to turtles that is essential for proper shell development. The Calci-Bone floats on water making it easy for turtles to access. Penn Plax Turtle Tuff-Shell M.D is a medicated Sulfa block to help harden your turtle's shell by treating the water your turtle swims in.